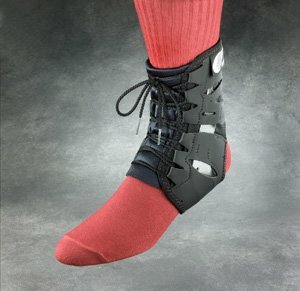 Combines the superior comfort of a lace-up brace with the greater support provided by a rigid brace. The patented design of the built-in stabilizer provides ankle support while allowing normal range of motion. The stabilizer will actually mold to the shape of the ankle simply from body heat for a more conforming, custom fit. The speed lacing system allows for quick and easy application of the brace. The outer brace material is Poly-Tex, an abrasion resistant and extremely durable fabric. The inner brace is ballistic nylon with internal laminated foam that provides both strength and comfort. Because the majority of the Tarsal Lok's support is provided by the shape and placement of the built-in stabilizer, it does not need the excessive material around the forefoot and heel normally found in other lace-up ankle braces. This low profile design makes it an ideal brace for a variety of applications, including sports like soccer, basketball and football. It is also an ideal brace for everyday use because it will fit comfortably inside almost any shoe style, not just athletic shoes. It may even be worn with orthotics.